Earlier this month I wrote about the perfect fit I’ve found with Homebound Publications, my publisher (I still tingle when I say those words – my publisher) for my memoir, Hiking Naked. I end this month with an afterthought about something else I treasure about Homebound—their biannual magazine, The Wayfarer. The fall issue just arrived in my mailbox, and it’s filled with beautiful poetry, prose, and visual art that encourage contemplation and promote practical change. I was especially moved by L.M. Browning’s interview with Nelba Márquez-Greene. Nelba’s daughter, Ana Grace, was one of the twenty children killed at Sandy Hook Elementary School on December 14, 2012. Nelba’s words about how she and her husband Jimmy Greene have “let the love and light in” to help them survive this tragic loss are humbling and inspiring. Their Ana Grace Project is helping others to heal, too. Homebound Publications does something else to support practical change. They donate 1% of their yearly profits to charity. This year, those contributions go to The Edible Schoolyard. Definitely a perfect fit Iris! 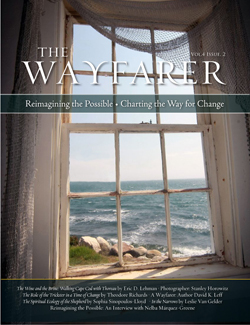 Thanks for sharing the link to The Wayfarer. Thanks, Sue. I think you’d enjoy The Wayfarer.